Bank of India is going to fill up vacant posts of Officer (Credit) in General Banking stream throughout India. Those who are interested in these Bank Jobs in India can apply online through the Bank website; there is no other way to apply for this Bank of India recruitment 2018. 1. 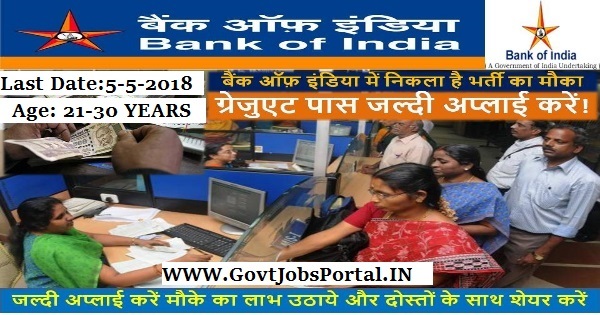 Age Bond (As on 01.04.2018): Candidates must have minimum age of 21 years and maximum age of 30 years for applying these Bank jobs in India under this Bank of India recruitment 2018. 2. Education Criteria: All Indian Graduates + MBA/PGDBM/PGDM/PGBM/PGDBA (or) Charted Accountant. Minimum 60% marks at graduation level is for candidates applying under general/unreserved category, candidates belonging to reserved category (SC/ST/OBC/PWD) applying for reserved vacancies (SC/ST/OBC/PWD) will be entitled for relaxation of 5% i.e. they should have minimum 55% marks at graduation level. 1. English, 2. General Awareness related to Banking, 3. Financial Management. What is the Process for applying this Bank Jobs in India? 20TH April 2018 is the Start Date for applying online. 05th May 2018 is the Last Date.